Background: ‘Seed shatter’ refers to the release of mature seeds from their mother plants, which allows offspring dispersal in the natural environment. In domesticated crops, however, the reduction of shatter is a desirable trait, as keeping the seeds on their mother plants facilitates efficient harvesting and prevents yield loss. 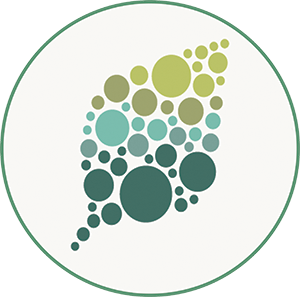 Previous studies have shown that seed shattering is determined by the development of the abscission layer, which is located at the junction of the seed base and the pedicel. In general, easy-shattering varieties form a complete abscission layer. By contrast, non-shattering varieties have incomplete abscission layers or lack the abscission layer altogether. In recent years, several key genetic factors regulating seed shattering have been identified in crops, and the selection of desirable mutations has promoted crop domestication and improvement by reducing shattering. Question: We wanted to know whether other genes participate in rice seed shattering. At the same time, we tested whether the mutation of a seed shattering gene can be applied for rice breeding to improve grain yield. Findings: We identified a loss-of-shattering mutant, named suppression of shattering 1 (ssh1), through a screen of mutagenized wild rice introgression lines with naturally high shattering. We determined that a single nucleotide change in SUPERNUMERARY BRACT (SNB), encoding a plant-specific APETALA2-like transcription factor regulating the development of floral organs, caused the transition from easy shattering in the wild type to no shattering in the mutant. 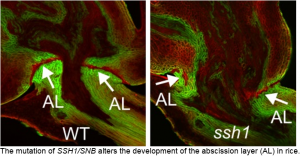 We found that SNB positively regulates the expression of two genes, qSH1 and SH5, known to modulate seed shattering, and also suppresses lignin deposition in the abscission zone. Interestingly, the loss-of shattering mutant had larger seeds and a higher grain weight than wild type. 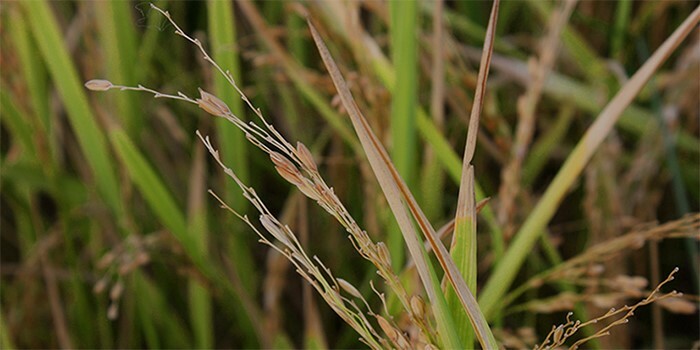 We introduced the mutated allele into a current high-yielding cultivar and observed a positive effect on grain weight in progenies harboring the mutated allele, showing that the new mutated allele has potential in rice breeding applications. Next steps: We aim to elucidate the SNB-involved regulating pathway(s) for seed shattering and seed size and explore genetic manipulation in the SNB gene to enhance rice grain yield in the future.